In early March 1775, an Irish soldier initiated a dozen or more black Bostonian men into a lodge of Freemasons, making them probably the first people of African descent formally admitted into Freemasonry in the Atlantic world. Prince Hall, a freedman, would emerge as the leader of this group as they worked together to establish a tradition of African American Freemasonry that has persisted ever since—a tradition that still carries his name. Also included are several appendixes containing key texts from Prince Hall Masonry, a glossary of Masonic terms, and lists of archival repositories and contact information for present-day lodges. 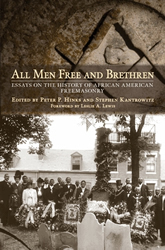 Edited by Peter P. Hinks and Stephen Kantrowitz, All Men Free and Brethren is a major contribution of the history of Freemasonry, African American history, and the broader history of race, citizenship, and community in the United States.